My RR time this week was spent shipping books and working on artillery. 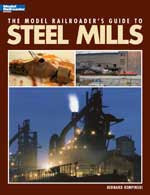 The book hit number one best seller on Amazon for Model Railroad books over the weekend! That was cool. I set up my mini-lathe and started turning barrels. I plan to do 3" Ordnance Rifles, 12 pound Napoleans, 12 pound howitzers and a 10 pound Parrots. Later I'll do the 20 pound Parrot. Those are the most common field guns. I detailed a couple carriages with laser cut parts and I think they look good. Here is an in-progress photo before the tires and trunnion plates are added. I like how the trail spike and elevation screw detail came out using laser cut parts. I was concerned that I may have to etch these, but the laser cut parts worked great. This is a 3" Ordnance Rifle, one of the more common Union guns. Today we were honored to host a visit from BG Daniel McCallum and his lovely wife (they are also known as Mike and Ali Doyle). 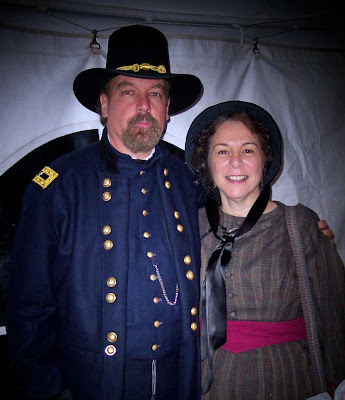 Mike has been helping me put together a Union officer's uniform to wear at various events when discussing the ACW railroads. We did not get a photo of our distinguished visitors at the layout, but BG McCallum's staff sent us this "official portrait." 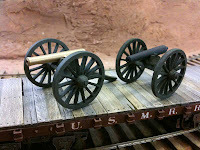 While here General McCallum inspected progress on the new O Scale artillery pieces that Alkem Scale Models is working on. 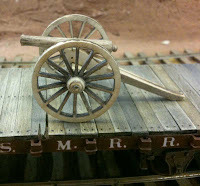 One of the problems that we O Scale ACW modelers have is that there are no true O Scale (1/48th scale) artillery pieces to go along with our trains and layouts. 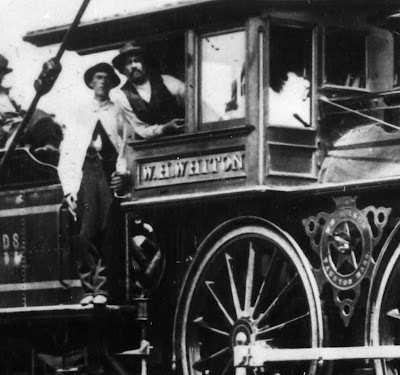 While some fudging is possible with figures since people come in different sizes, artillery, wagons and other mechanical conveyances need to be much closer to scale. The cannons from Sash and Saber, the only manufacturer that makes cannons in 40mm scale, are too big by about 20 percent. They scale out to about 1/40th scale. 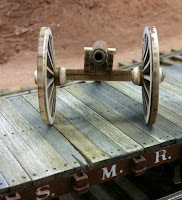 Most of cannons in 28mm scale are too small. 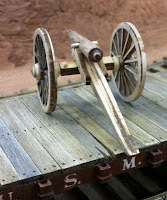 To address the problem I decided to try making some true 1/48th scale artillery pieces. 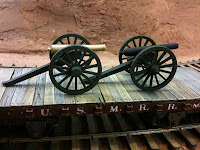 I made a trip to Ft Ward to photograph and measure the artillery pieces they have there. There I found out that the prototype wheels are 56 inches in diameter. I also took several other measurements to help in putting together a model. One key dimension that was a bit of a surprise was that the dishing of the wheel is only about two inches, or .040 inches in O scale. This is barely perceptible. To capture the dishing, I tried different techniques, but the laser cut versions you see here worked the best and are easiest to assemble. The gun tube started life as the end of a paint brush that was close to the actual necessary size. I turned it on my Dremel "lathe." The trick will be to get these cast in resin of perhaps pewter. Next step is to add all the wrougth iron detail parts such as the elevating screw, reinforcing nuts, trail spike, etc. These will be bits of wire and laser cut elements. Depending on production, we'll offer these as kits. We'll also try to develop limbers, caissons and supply wagons to fill out the line as time permits. Painted but still awaiting details. The bronze gun is a 12 pound Napoleon of the Union design with flared muzzle. The black cannon is a 3 inch ordnance rifle. I was ordering some new supplies from one of my favorite ACW figure vendors, Military Miniatures Warehouse when I noticed they were carrying a new (at least to me) line of 40mm figures. The figures are from Drabant, a Russian firm, that has a wide variety of 40mm figures for 17th and 18th century wars. They also have a set of 8 ACW Union soldiers in a marching pose. The pose is not as warlike as most wargaming figures and will work well for a unit behind the lines in winter quarters. The Drabant's very nice website has photos of each figure from different views. Military Miniatures Warehouse only has 6 of the 8 figures listed, so I ordered a batch of those and we'll see how they look. They are a bit pricy at $7.50 per figure. 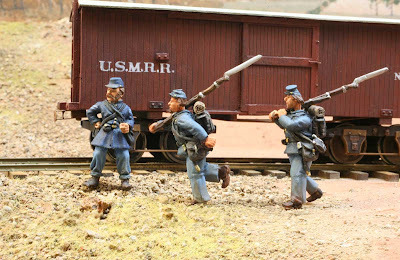 I also found a US company, Knuckleduster Miniatures, that makes 40mm Old West figures that are suitable for O Scale ACW use. I ordered sets of his townsmen and women/children. Some of his gun fighters may also be suitable with minor modifications. I like the sculpting of these as the figures have a leaner, more realistic look than most. 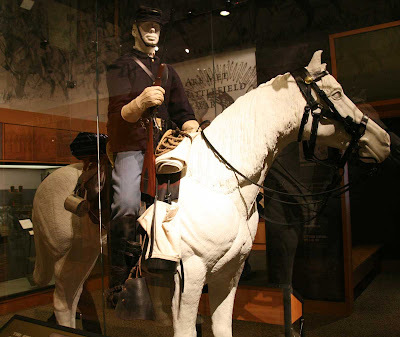 I had a chance to visit the new Gettysburg Battlefield Visitor Center today. This is a completely new facility built about a mile east of the old center on Cemetery Ridge. The new center is really great. The museum is very well done, taking the visitor from the origins of the war through details of the battle and the aftermath. The movie theater played a circa 10 minute film narrated by Morgan Freeman called, "A New Birth of Freedom." The film frames the civil war around the issue of slavery, especially the problem of whether to incorporate the new western states as "slave" or "free." These photos show some of the displays at the museum. The uniforms and equipment are great references for painting and detailing miniatures. 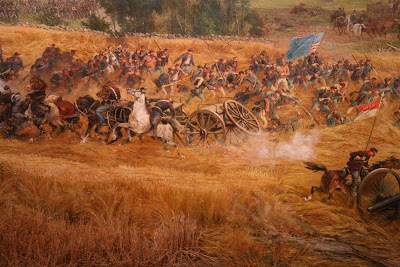 But the real gem of the center is the restored cyclorama. Originally painted by Paul Philippoteaux and a crew of 5 to 20 men, it has been thoroughly restored and expanded. The $16 million project results in a larger, spectacular image, has a better 3D diorama incorporated into it and has special lighting and sound effects that are quite stunning. This has got to be the best backdrop ever painted! Check out the close up photo and look for where the 3D scenery transitions into the 2D painting. Click on the upper wide angle photo and examine the water well - half of the well is 3D while the back half is 2D. Seamless integration. I was able to get these amazingly clear photos using my Canon 5D at ISO 1600 using the safety railing as a temporary "tripod." I panned the camera and combined the images in Photoshop using Photomerge. The images I posed here have are 1,200 to 2,000 pixels. The base images from the photomerge are 8,000 pixels across. Before I get back to track laying, I wanted to finish up some figure painting and modification projects I had going on. This time I wanted to build a head end crew for one of my trains. I planned for an engineer, conductor and brakeman. 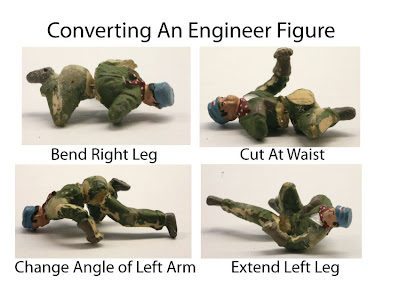 The engineer started off as a Woodland Scenics figure. H e was seated with his left arm raised. This pose works for a more modern steam engine with a transverse seat and an elevated Johnson Bar. But my locomotives have longitudinal seats and lower Johnson bars. Dave Schnieder and I corresponded about this. He convinced me that engineers in this period operated their engines while standing. To hang out the window like the engineer is doing in the prototype picture at the left, he had to kneel with at least one knee on the seat. Armed with that information, I began converting the Woodland Scenics engineer. First I cut him at the waist and drilled holes in torso and hips for a piece of wire. Then I cut his right leg at the knee. I sanded the pieces so that he could be kneeling on this leg. Next I cut the left leg at the hip and knee. Drilling holes for small bits of wire and pinning the pieces together allowed me to adjust this leg so that the figure could fit in the cab. The head on the Woodland Scenics figure is not well molded and has a hat that I didn't like, so I cut it off. I also removed the bandana. I used a bearded head with a square slouch hat from Sash and Saber. I made a sack coat from a piece of Magic Sculpt putty that I rolled out to a thin sheet. I also used the Magic Sculpt to fill in gaps. If you haven't worked with two part molding epoxy, I recommend you try it. 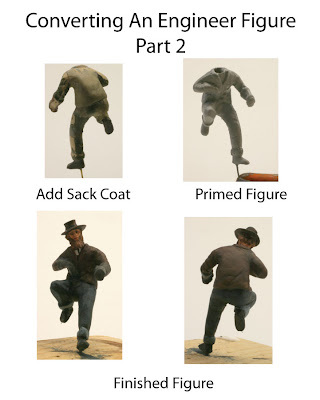 It is a bit tricky to learn how to use, but is great for sculpting of figures. This engineer is named Schaefer, in memory of a good friend. 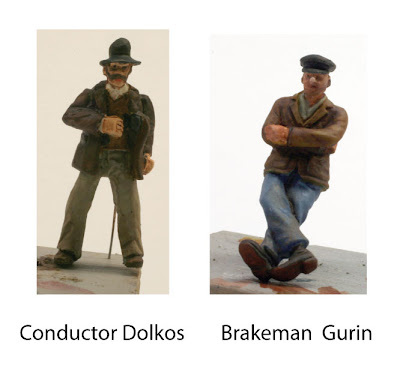 The conductor is a wild west figure from an forgotten UK manufacturer (either HLBS, Rabble or Stadden). I filed his hat to look more like a slouch hat instead of the ten gallon, wide brimmed Stetson he was hearing. The seated figure is a 1/43rd scale engine crew figure from Trackpass, unmodified. Here they are working their engine at Falmouth. The engineer is glued into the cab. I eventually plan to name all the figures on the layout. If you paint a figure, it or another will bear your name. So if you want to be included let me know. The recruitment office tells me that Captain Drye has a company of men ready to join the Army, plus several sutlers, surgeons and other assorted folk. Here is a video showing the B&O Mason #25, a 4-4-0 being operated. This is the oldest running steam engine in the USA. Note how the engineer stands. Thanks to James for the link to the video. Privates Clarson and Peck report to duty to relieve Private McGuirk at Potomac Creek bridge while Corporal Emery supervises. Now, another quiz. See if you can spot the mistake in these photos. I have since corrected it, so you'll have to look closely. Hint:It may help if you take a break in between looking at the two pictures.